Games are played in the spring and fall. Our spring season typically begins the first Saturday after the April school vacation week and our fall season typically begins the Saturday after Labor Day. Our seasons run 6 to 7 weeks, depending on the time of year. Games last about 60 minutes each and we schedule them throughout the day on Saturdays. There is no fee to participate in our league. Every player will receive a Red Sox jersey and cap. Click here to register your child for the upcoming season. For first time users of our online registration system, there is a three step process for registration. First, you must create a family account and then add your child as a participant. You must then register your athlete for the specific season. Previously created family accounts and participants have been saved in the system. Use your account username and password to sign back in, make changes, add participants, and register for future seasons. Visit our Volunteer section to register to be a volunteer "buddy". After the registration period ends, each player is assigned to a team. Each team has a coach, and each player is assigned a buddy for the game who provides encouragement and assists with hitting the ball and rounding the bases. Several weeks before the season starts, you will be contacted with your team list and game schedule. The schedule will also be available on our website a few weeks before the season starts. The Miracle League of Massachusetts is dedicated to providing a safe and enjoyable baseball experience for children with cognitive, physical, emotional or behavioral disabilities. We welcome girls and boys between the ages of 5 and 22, regardless of previous experience or level of ability. All players will receive a Red Sox jersey and cap at opening day. Players can wear any shoes and can bring their own glove, if they would like. Gloves are not needed to participate, but some of our players like to have them. Bats and balls are all provided. 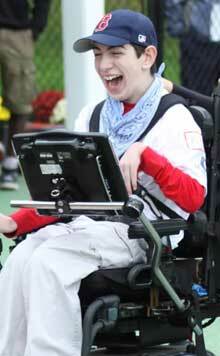 All games are played at the Joseph Lalli Miracle Field at NARA Park in Acton, MA. Our address is 75 Quarry Road, which is on the far side of the park. Acton is located in the Metrowest suburbs of Boston. We are 25 miles northwest of Boston and 35 miles northeast of Worcester. Click here to see a map. You can visit our FAQ section for more information, or feel free to contact us at (978) 263-3043 if you need further assistance. We hope to see you at the ballpark!